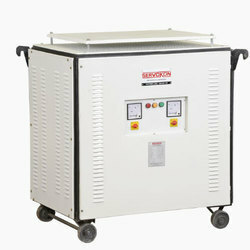 Prominent & Leading Exporter from Ghaziabad, we offer step down transformers. Our clients can avail from us a comprehensive range of Step Down Transformers. These are manufactured at our advanced manufacturing unit. We make use of premium quality components keeping in view the application requirements. Owing to their high performance and low power consumption, these are widely demanded in the market. These transformers are mainly used in the printing machines and other imported appliances. These transformers comprise of two or more coils of insulated wire that are wound around an iron core. On the application of voltage to the primary coil, the iron core gets magnetized that further induces a voltage in the secondary coil. In the end, the turns ratio determines the amount of voltage transformation. Looking for “Step Down Transformers”?